the White House Blue Room during his second full day as President. VietPress USA (April 18, 2018): Eleven days before the US election in November, Mr Comey reopened an investigation in Hillary Clinton's use of a private email server while she was secretary of state. A week later, he announced the new investigation had found no criminal activity. However, Mrs Clinton holds Mr Comey to blame for her surprise defeat in the election. She said analysis of polling by her team showed Mr Comey's intervention was pivotal. She had led in almost every poll before Mr Comey announced he was reopening the investigation. the White House Blue Room. 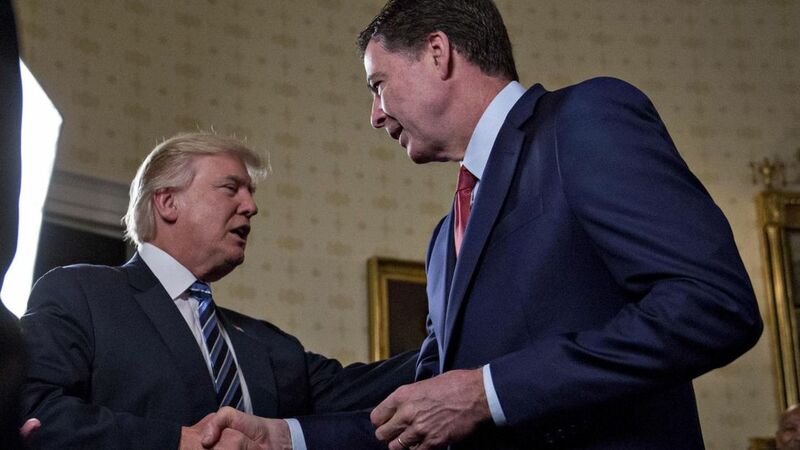 Trump gave FBI Director James Comey a hug then a firmly handshake and patted Comey on his back, joking: "He has become more famous than me." Rosenstein wrote a two-and-a-half page memo with the subject line “Restoring Public Confidence in the FBI” that stated the reasons why Comey should be removed. The memo cited Comey’s “handling of the conclusion of the investigation of Secretary [Hillary] Clinton’s emails.” Rosenstein criticized Comey for holding a press conference on July 5, 2016, to publicly announce his recommendation not to charge Clinton, and for announcing on Oct. 28, 2016, that the FBI had reopened its investigation of Clinton. Comey’s firing came less than two months after the director confirmed at a congressional hearing on March 20 that the bureau is investigating “whether there was any coordination between the [Trump] campaign and Russia’s efforts” to influence the 2016 presidential election. In January, the Office of the Director of National Intelligence released a declassified intelligence report that found “Russian President Vladimir Putin ordered an influence campaign in 2016 aimed at the US presidential election” with the goal of hurting Clinton and helping to elect Trump.